An inflatable loft is the goal in a recent NASA engineering competition; the intent is to increase living space on lunar or Martian habitats. 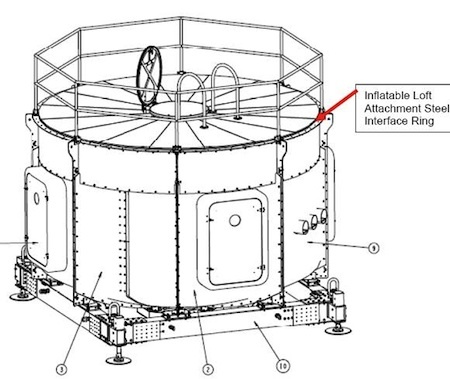 The inflatable second storey for the prototype Martian or lunar mobile home is to interface with NASA's "Barrel Interface Ring" on the roof of the hardshell ground floor. It should offer room enough to sleep four, and be reconfigurable as a "crew gathering" or "group meeting" area. Science fiction fans have long been familiar with this concept, popularized by writers like Larry Niven, who wrote about inflatable expansion bubbles in his 1994 story Crashlander. From The Register; didn't I see this @nyrath?